Single wide mobile homes are available with a variety of floor plans and price points, so homeowners can make the most of their investment while still staying on budget. With so many options for upgrades and beautiful homes built by leading manufacturers such as Cavco Durango, Cavco West, and Fleetwood Homes, there is sure to be a single wide mobile home that is perfect for you and your family. The floor plans of single wide mobile homes range from one-bed, one-bath options that are 379 square feet up to three-bed and two-bath models that are 1,026 square feet. 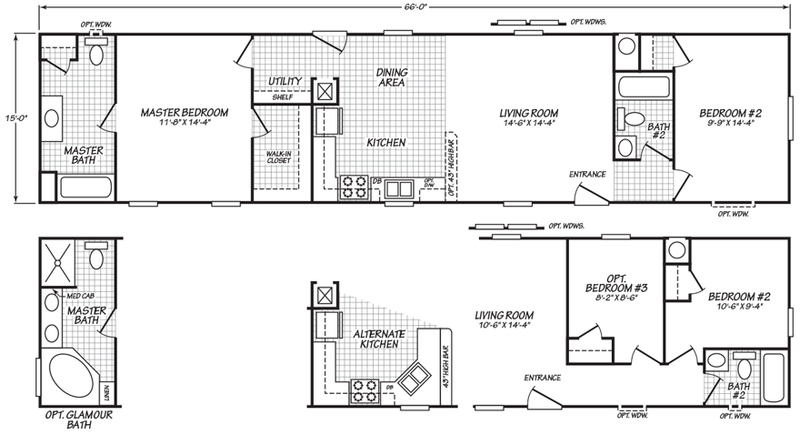 One-bed models tend to have a bedroom at one end of the mobile home and the living space at the other end, with the kitchen in the middle. Single wide mobile homes with multiple bedrooms usually have a master bedroom at one end, with the other bedrooms at the opposite end and the living room and kitchen in between. Some homes with multiple bedrooms have a master bath attached to the master bedroom, while others only have shared bathrooms. When choosing a floor plan, there are a few different things that you will want to consider. Your preferences, needs for your family, and budget will all naturally be taken into account, but don’t forget to factor in the space available on the land you are using and restrictions for the community in which you will put your home. Different floor plans vary within a few feet in terms of both width and length, and even if the differences seem negligible, they can still have a dramatic impact on the positioning of the mobile home. Cavco West, Cavco Durango, and Fleetwood Homes all offer a number of ways to customize your single wide mobile home. Although the specific options are different between brands and models, you can expect to be able to choose your carpeting, cabinets, wall colors, and siding styles and colors. There are also a number of options for upgrades to add onto your single wide home so that it will have the specific features you want. Again, the exact options that are available depend on the manufacturer and model you choose. However, you may be able to add a washer and dryer hook-up, a front porch, additional entries, a box bay, and even additional space in a room, called a stretch. Crown molding, backsplashes, and other finishing touches are also available.